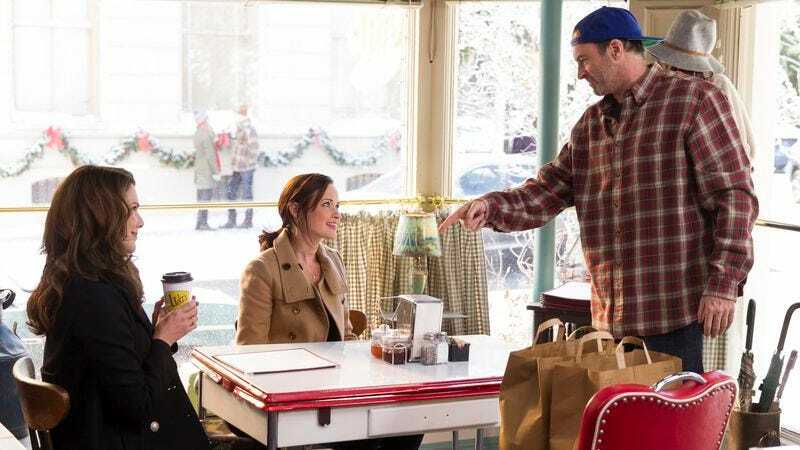 The Gilmore Girls TCA panel this summer began with the same few minutes that kick off this episode of “Winter.” Then as now, I had the same thought: It’s trying a little too hard. Of course we would begin with what everyone knows is Lorelai’s favorite season, and we want the sleigh bells, and the coffee, and the “la la la”s, and scarves. We want that rapid-fire banter and non-sequiturs, but this opening conversation feels a bit forced. To help us jump right back in, Lorelai and Rory toss in meta commentary like “How long’s it been?” “Feels like years.” If you were going to imagine how Gilmore Girls would return, it would be exactly like this. Somehow, that’s mildly disappointing. That seems to be the only drawback to this reboot so far: It’s everything we expected, a by-the-numbers return. I’ll be taking on these episodes on one by one, and I feel like Amy Sherman-Palladino is giving GG dorks like me everything we could have ever wanted, which is shockingly effective even as I know I’m getting played. The devout cast list alone should have clued us in to the fact that this reboot would adhere as closely to the original as possible. We are watching “Winter” to see Lorelai and Luke stroll through the town’s winter wonderland with Paul Anka and get glogg from Kirk’s stand to the tune of Grant Lee Buffalo’s troubadour. It’s a page right out of the Stars Hollow coloring book. With so many characters, maybe it feels like a rush to include everyone, no matter how slight, just to give viewers and fans an idea of where Hep Alien is now, for example. The few minutes of band practice we catch is quick, but tells us everything: Zack is fighting his descent into the corporate world, Brian still crashes in the spare room, Sebastian Bach is still Sebastian Bach. Best of all, of this series’ embrace of fun covers, even Shonen Knife’s take on The Carpenters is bested by HA’s version of Joe Jackson’s “I’m The Man,” the perfect theme song for Zack’s corporate rebellion. For the town overall, Sherman-Palladino has doubled-down on the Stars Hollow regulars: If you want the quirk, she’s bringing you the quirk. Nine years later, it’s refreshing to see how little has changed, and so gratifying to see Kirk start up another business, or Taylor and Luke bond over hatred of people who want to use wifi to work in a diner (guilty). Michel and Lorelai are still going to spar constantly, and Cesar can’t remember to plug in the toaster. There’s something highly unrealistic about this Brigadoon stopped-in-time town, but also rather comforting. I have the luxury of writing this a few days after these episodes launched, so I’ve seen some of the thousands of internet words already written about this revival. Overall, the main critique appears to be with the Rory storyline, namely about her career. Talk about unrealistic. Many of these online words were written by TV critics who are or who have been freelance writers themselves. Their international travel on a typical day, especially now in the digital age, may involve moving from the kitchen to the living room. Possibly to a diner with wifi. Rory’s constant jet-setting back and forth to London (at least $700 a clip) adds up to one New Yorker “Talk Of The Town” piece in nine years? We could have used a little more back story, because otherwise it looks like she’s just heading back asap to sit and wait for Logan on his giant sectional sofa. Is she using her trust fund? She must be, right? Alex Kingston was fun and hammy as Rory’s new interview subject, but a little goes a long way there. Logan’s reveal was a too-cute trick: Was Rory perhaps talking to herself in that palatial pad? Of her exes, it was pretty obvious that Dean was not going to emerge from that bathroom. Matt Czurchy did a lot to redeem himself post-Logan on The Good Wife, but here he’s right back in cad form, as he and Rory carve out their “only in Vegas” relationship. As usual, with Logan, Rory settles for too little, and this version is a far sight from the guy who wanted to marry her in the second-to-last episode of the series. Still, Rory’s magical ascendancy to Chilton, to Yale, to life, has been fairly unencumbered, give or take a yacht theft, so seeing her grapple with her career is a much better take than wasting this return just on her romantic trials (Paul!). The flashback to the funeral, then, offers several different types of heartbreak: Just picture Emily’s relieved and surprised face when she learns that Lorelai is going to stay at the funeral, only to have it turn out the way it did. Yes, Lorelai should have just fled the room or something, and yes, Emily’s request that she perform on command was unfair, but we also have to cut the Widow Gilmore some slack. It’s the only way we can come back after all the horrible things Emily hurled at Lorelai in the kitchen, that she was in so much pain she had to unleash it all on someone, and Lorelai was there. But as always, with these two, Lauren Graham and Kelly Bishop are this series’ high-water mark. It’s practically breathtaking to witness. I even wonder what it must be like to film that with someone you ostensibly like, how to conjure up so much anger and pain, how much trust between the two performers to open up so unflinchingly in a performance. It’s Arthur Miller on Netflix. The only way to follow up that kind of emotional devastation is for Lorelai to walk in on her mother’s home purge in a Candie’s T-shirt and Billy Squier jeans. Because no matter how much they fight, and how much exists between them, they’re always going to come back to each other. For Lorelai and Emily, there’s no severing that tie. As Emily rightly points out at the start of the episode, they’re all Gilmores, and the correct version of the Gilmore Girls title takes all three of them into account. It’s heartening to know that this reboot will focus on all three generations, and especially, next episode, Lorelai’s therapy sessions with her mother. The Gilmore family dramas have always been this show‘s not-so-secret strength: They’re the gravity and weight that keep this otherwise magical concoction from floating off into the firmament. After all, people dressed up like snowflakes and brightly colored Christmas trees in the town square only go so far. Emily Gilmore is forever. Everything that Lorelai and Rory eats is beige. I have no doubt that all of those Lifetime movie titles are real. I’m glad Kirk got bagels thrown at him for the “Luke, control your woman” remark. Of all the returns, was anyone more welcome than Paris firing another intern? Even though her life has changed absolutely completely—running her own fertility clinic, splitting from Doyle in a meta-commentary to Danny Strong’s real life as a screenwriter—Liza Weil’s portrayal is blessedly and hilariously exactly the same. That said, Paris is practically the only thing saving this Lorelai-Luke surrogate storyline, which is hopefully over as of this episode. I get where Lorelai was going, but I think the conversation in the diner diminished the kids he did have. He’s aways been a father figure to Rory, and has his relationships with Jess and April. He even laminated Rory’s story on his new menu! Was not expecting so many utterances of the name Neil Patrick Harris. I know my A.V. Club colleague Alex McCown-Levy appreciated the brief return of Jason Stiles at the funeral. I appreciated the use of Spinal Tap as a verb. Also appreciated the barely disguised dissing of Marie Kondo. Logan’s quick aside of “Hamburg” lets us know that Rory is at least on the track of what she set out to do: see the world while writing about it. I will be posting the next three episodes every other day, so “Spring” on Wednesday, November 30; “Summer” on Friday, December 2; and “Fall” on Sunday, December 4. If you can’t wait, Myles McNutt did an amazing job of churning out four episodic binge reviews on November 25, the day of the drop. And Erik Adams has already offered his thoughts on the season overall.